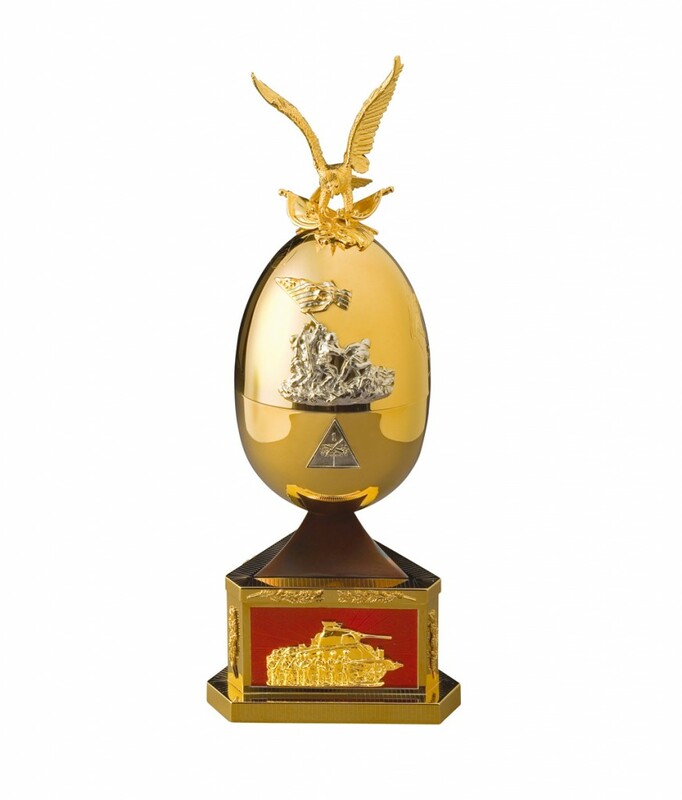 Theo Fabergé, only living grandson of Russian Imperial Jeweller Carl Fabergé, has created the VICTORY EGG in celebration of the 60th anniversary of the triumphant close of World War II, and in tribute to our leaders and servicemen. Theo chose as his finial, the Eagle of Justice. 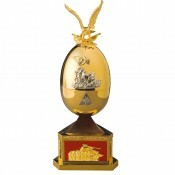 Also in sterling silver and 24-carat gold, the Egg itself is offset to the front with a model of Iwo Jima. 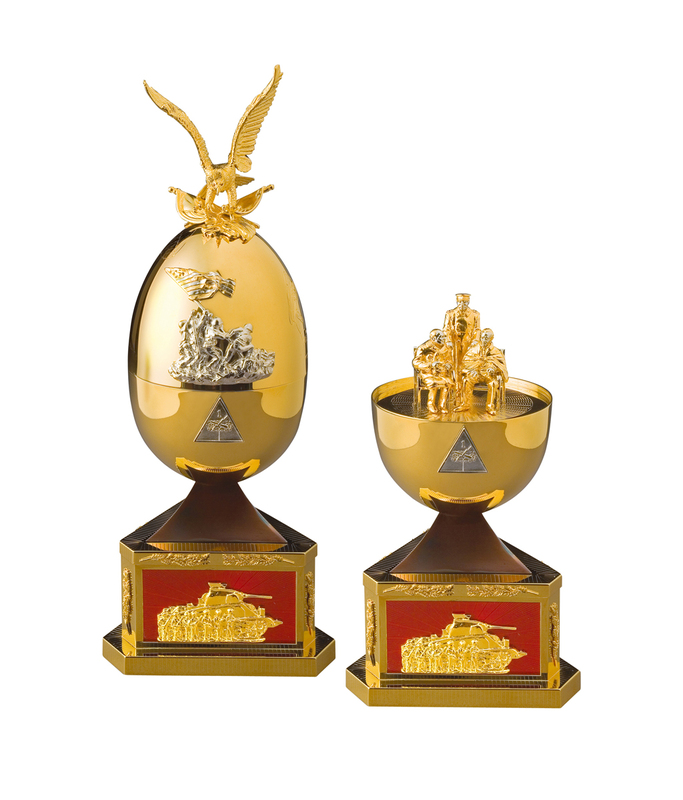 To the side, entirely hand engraved, General Dwight D Eisenhower supreme Allied Commander for Europe, and General Douglas MacArthur Supreme Commander of Allied Forces in Southwest Pacific. To the obverse, the engraver’s art depicts paratroopers’ airborne landing on D-Day. 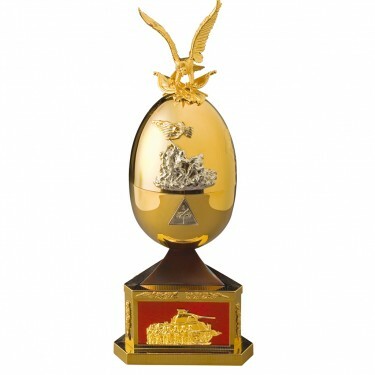 To the base of the Egg are hand-crafted emblems of the three armed services ’ the official badge of the Navy Amphibious Unit; the sea-horses of the Fifth Marines; and the emblem of 'Old Ironsides' ’ the First Armored Corps. On the pedestal, Theo has placed three panels in guilloché enamel on sterling silver. The Navy is represented by the Pennsylvania; the Airforce, by three Avengers and the Army is depicted by the 60th Infantry Regiment advancing in a European town. 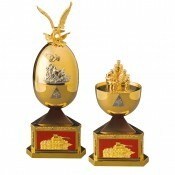 Open the Egg, to view the surprise; miniatures of Stalin and Churchill turn to President Roosevelt at the famous Yalta conference. Materials: Sterling silver, 24 carat gold and metals.